Developed by Virologist Dr. Madeleine Mumcuoglu, Sambucol products can help support and maintain the immune system. The unique preparation method for the standardised elderberry extract used in Sambucol preserves and maximises the naturally occurring health benefits of the berry. 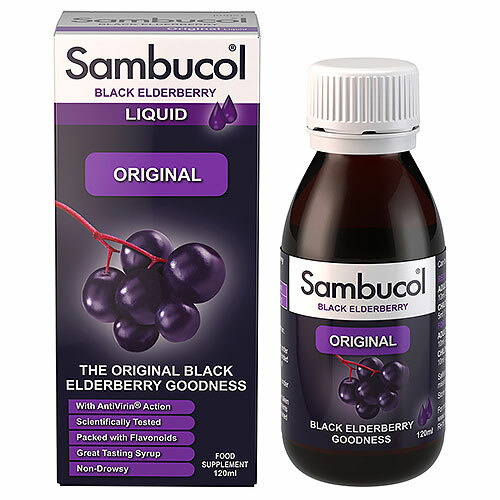 Sambucol is produced from whole black elderberries and has the equivalent of up to 1000 black elderberries in every 120ml bottle. Sambucol has been awarded first prize for the best new health product and best Elderberry product for four consecutive years in the U.S., and is being successfully used by millions of people around the world. Free from artificial colours. Sambucol has been laboratory tested. It is suitable for mother`s to take Sambucol whilst breast-feeding. Glucose syrup, black elderberry extract, acidity regulator: citric acid, preservative: potassium sorbate. Adults: Take 2 teaspoons (10ml) daily. Children under 12: Take 1 teaspoon (5ml) daily. Adults: Take 2 teaspoons (10ml) four times daily. Children under 12: Take 2 teaspoons (10ml) twice daily. Kosher: Supervised by Chief Rabbinate of Beth Din de Paris. Do not take if you are pregnant or likely to become pregnant, except on the advice of your doctor. 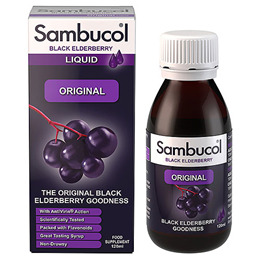 Below are reviews of Sambucol Original - Black Elderberry Extract - 120ml by bodykind customers. If you have tried this product we'd love to hear what you think so please leave a review. Sambucol Original - Black Elderberry Extract - The flavonoids present in this formula are the most potent natural antioxidants available. Sambucol products can help support and maintain the immune system. Can be used throughout the year.